On November 23 & 24, I attended the first ever Android Dev Summit. The following are notes that I took during talks. I have included the video of the talk as well. Again, these are my notes from the talk, not my original content. 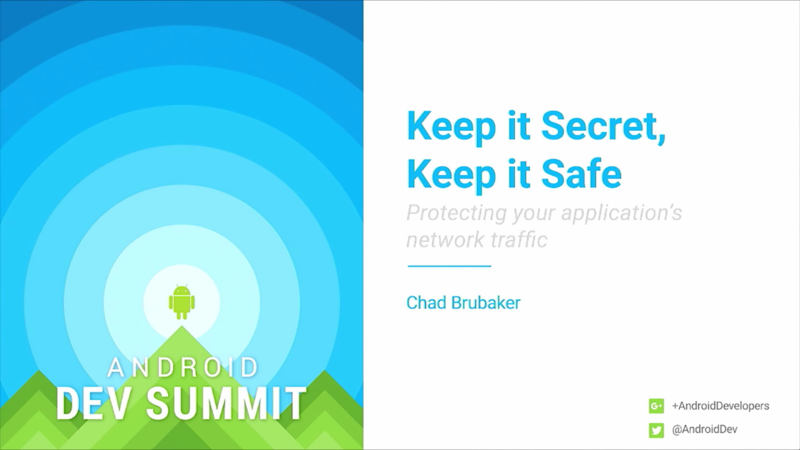 Protecting the network traffic in your app. The network is not to be trusted. This has always been true, but especially for mobile devices. On the server-side, you should secure your traffic. All traffic must be protected. Goal the network cannot affect the security of your device. Modern platforms have safe defaults and it is just as simple as using TLS. Using standard HTTP libs, replace http:// with https://. Use SSLSocket for socket connectisons. ssllabs has a good intro for server-side. Hardcoded URLs - what about redirects? Server provided - maybe you forget on the server? Third-party code - how do you check them? Uses packet inspection to catch all non-TLS traffic. Useful during development to make sure that all traffic is going over TLS. Some false-positives, e.g. HTTP proxies, protocols with STARTTLS logic, or secure traffic that doesn’t begin with a TLS Hello. Blocking will fail quickly, and obviously. 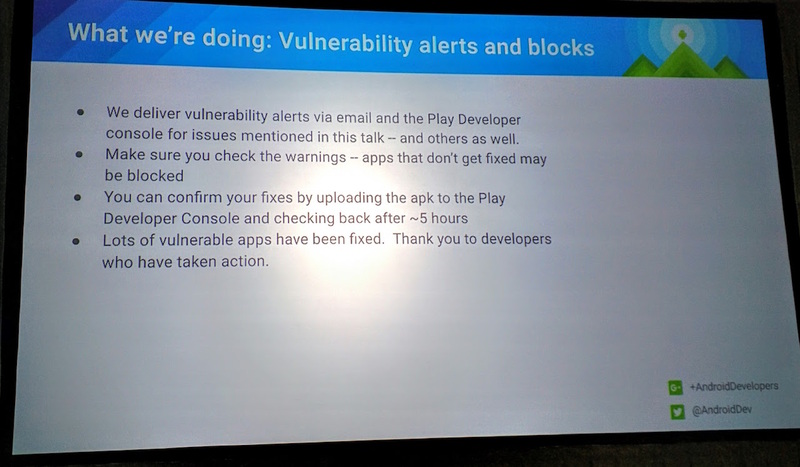 Fixes will be true for all devices. Using the default implementation is a good idea. However, you can override the defaults with insecure code. Legacy servers, with legacy clients choosing what cert to present for a connection. TLS with Server Name Identifier (2.3+) extension solves some problems around knowing who you’re talking to. Some internet routing may not support all of the TLS protocols, and may downgrade to SSLv3. How do you know if you trust this chain of certificates? What ships with your devices? Your app can use its own CA, which may make sense for various applications. However, the example code out there may not be great. Documentation.